There are a few indicators that need to be considered when looking at the dominant hand palm print for insights on love in Palmistry. Below are some very general things to look for. 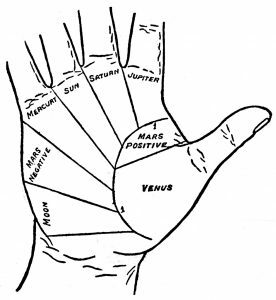 To cover all of Palmistry in this article would not be possible nor would it do it any justice. There are a few general things to look for. The size hand is vital as well as the shape of the hand. The type of hand is classified by 4 categories: Fire, Earth, Air, and Water. Notice that this classification is also used in Astrology. In Palmistry it carries a similar meaning. Yet, a person may be born under a fire sign and their hand may fall into a different category. Fire hands are usually long palms; these natives take action in relationships. Earth hands are short; these natives are dependable and practical. Water hands tend to have long fingers; these natives carry a lot of empathy and emotion in the hand. Finally Air hands are thin and square shape; these natives seek a mental connection. The Venus mount by the thumb is an important area to inspect. In this mount we can see the family, desire, love in one’s life, and romance. Markings on the palm such as crosses, islands, lines, stars, and other points along with timing give an idea of what love will be like. Another area to inspect for love is the Girdle of Venus. It is located under the ring and middle finger. It makes a smile. It is a line of creativity as well. Some old text books give this line a bum rap stating it is insatiable and promiscuous. Yet not everyone has a prominent Girdle of Venus and yet still has a prominent and functional love life. Another factor to consider is the type of the lines and marks associated will give more insight to love life. Some say that this marking can make the native highly-strung with and nervous temperament. The native is super sensitive may get easily upset, restless and susceptible to mood swings. Charles Manson had a strong Girdle of Venus, yet we need to factor in the entire person. Yet not everyone that has this type of prominence is like Charles Manson! The Marriage Line in Palmistry indicates the married life of the person. Typically it is found under the index finger. A gypsy’s myth spread stating that the number of Marriage Lines would determine how many times a person would get married. However this is not the case. Not everyone has a marriage line and still gets married. It is important to see how this line (like any line) connects to the other lines which determine fate and characters attracted. b) Curved Heart Line ending directly under index finger usually has high standards. d) Crosses under the index finger indicate a happy union. It is also important to note that there is an Eastern and Western school of thought when it comes to Palmistry. Sometimes the Westerners borrow from the East. In the next few articles I will cover finances in the palm.